It is not every day that you see a man clad – from the frill of his upturned collar, to the tips of his slashed velvet slippers – in blushing coral hues. It is a rarer thing still to be struck by that same man’s determinedly un-frivolous aspect. Giovanni Battista Moroni’s famous Man in Pink, Gian Gerolamo Grumelli – a nobleman from Moroni’s native town, Albino – cuts an imposing figure. Eyeing the viewer sidelong, in a manner at once authoritative and wary, he stands with one hand casually resting on the sword at his hip. The pink that stains his cheeks and skids across his brow is not the gentle blush of youth, but the sign of quick blood and a warm temper. He holds his head marginally, and awkwardly, forward. While Moroni wielded his brush with evident ease and consummate skill, the genius of his paintings exists, curiously, in the way that his subjects so conspicuously, and defensively, exert themselves. Moroni’s portraits picture all the strain – and with it the charisma – of self-consciousness. Take Isotta Brembati: the daughter of a wealthy patrician family from Bergamo (the city in Lombardy where Moroni made his name), who later married the aforementioned Man in Pink, sits bolt upright in her Savonarola chair; tight-lipped and blue-eyed, her expression is firmly set against the betrayal of any emotion. A marten stole cossets her broad shoulders, a gold chain draped from its nose across her bodice. She wears a lavishly patterned green-bronze dress, and in her lap she holds a fan of candyfloss ostrich feathers. The combined effect is that of a woman circumscribing herself – with great deliberateness – in all the high silliness of wealth. The effect of all this could be ridiculous, but it isn’t. Allan Braham wrote, in the 1970s, that Bergamo still looked ‘impregnable […] jealously preserving its local traditions, and a reputation for shrewdness and penetration.’ The collective psyche of Moroni’s portraits could be similarly characterised. Isotta, herself, is shrewd and unshakable in all her stout puffery. A portrait of Don Gabriel de la Cueva (1560) is stark in its display of obdurate power: if the subject’s frigid eyes did not speak loudly enough of his indomitable spirit, an inscription reads, in translation; ‘I am here without fear and have no dread of death’. It is not merely the flamboyant Bergamesque elite who express this marble will; his more modest subjects share the same alert posture, the same spirit of resistance against misrepresentation. What they do not share is the appearance of armoured vulnerability. In the Portrait of a Lateran Canon (Basilio Zanchi?) (c. 1558), the sitter, unadorned in his cream cassock, looks out with a gaze that is humorous and incisive. He is no mere object of a painter’s attention; he sees Moroni and the quality of this encounter is what strikes the viewer immediately. And behind him, nothing but wolfish shadow, all smoke and slate grey. If Gian Giovanni Grumelli was striking in pink, it is nonetheless Moroni’s use of grey that really steals the show. 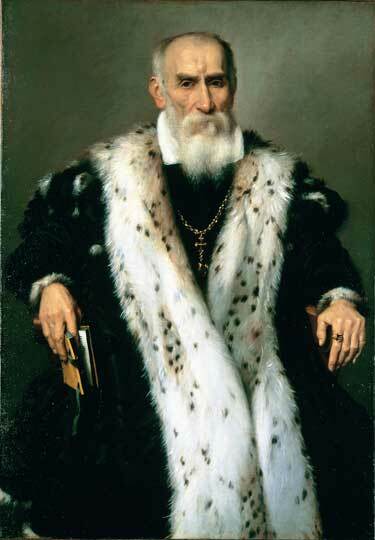 Be it the weathered grey of some half-ruined edifice, the polished chill of grey-veined Carrara marble, or the undefined mouse-grey of a dimly lit room, Moroni employs grey as the backdrop for almost all of the portraits in this exhibition. His greys do not exist somewhere half way between black and white; they are complexions tinged with green and violet, brown and yellow. Grey is simple and full. It is a colour that speaks of the naturalism of Moroni’s approach; even as he distils in paint the full resplendence of a sitter’s garb, he is busy making the colours in the shadows dance. ‘Giovanni Battista Moroni’ is at the Royal Academy of Arts, London, until 25 January 2015. I agree. I don’t know how I failed to allude to he poetry. I had not, however, meant to suggest that she was silly, but rather that all the conspicuous accoutrements of her wealth become expressive of far more than that: they reflect her strength of character.